Anna Loveland, a postdoc in the Grigorieff Lab, has a new paper, “A general approach to break the concentration barrier in single-molecule imaging” that appeared today in Nature Methods online. The paper is based on her PhD work, which was done jointly in the labs of Antoine van Oijen and Johannes Walter at Harvard. Single-molecule fluorescence imaging is often incompatible with physiological protein concentrations, as fluorescence background overwhelms an individual molecule’s signal. Loveland et al. 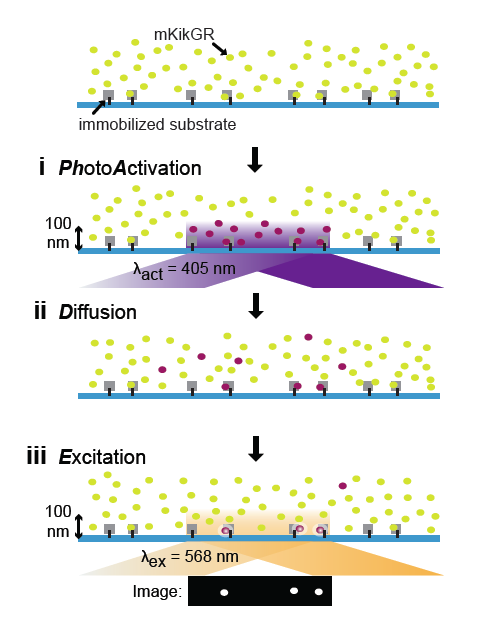 employ a new imaging approach called PhADE (photoactivation, diffusion and excitation). A protein of interest is fused to a photoactivatable protein (mKikGR) and introduced to its surface-immobilized substrate. After photoactivation of mKikGR near the surface, rapid diffusion of the unbound mKikGR fusion out of the detection volume eliminates background fluorescence, whereupon the bound molecules are imaged. The authors labeled the eukaryotic DNA replication protein flap endonuclease 1 with mKikGR and added it to replication-competent Xenopus laevis egg extracts. PhADE imaging of high concentrations of the fusion construct revealed its dynamics and micrometer-scale movements on individual, replicating DNA molecules. Because PhADE imaging is in principle compatible with any photoactivatable fluorophore, it should have broad applicability in revealing single-molecule dynamics and stoichiometry of macromolecular protein complexes at previously inaccessible fluorophore concentrations. Alexandra M. Deaconescu, a research associate in the Rosenstiel Basic Medical Sciences Research Center and 2008-2010 Fellow of the Damon Runyon Cancer Research Foundation, together with Professor of Biochemistry and HHMI Investigator Nikolaus Grigorieff and collaborators in the Laboratory of Dr. Irina Artsimovitch at Ohio State University have just published a new study in PNAS, which delineates novel mechanistic details of transcription-coupled DNA repair. In any cell, there is intense interplay between various DNA-based transactions, such as replication, transcription and DNA repair. More than twenty years ago, it was discovered that DNA lesions that cause stalling of RNA polymerase molecules elicit a form of preferential nucleotide excision repair (NER) that exists in both eubacteria and eukaryotes, and specifically targets the transcribed DNA strand. Termed transcription-coupled DNA repair (TCR), the process is found to be carried out in bacteria by an ATPase called Mfd or TRCF (see Figure, right). In TCR, TRCF performs two functions: 1) it recognizes a damage-stalled RNA polymerase (RNAP), then dissociates it off the DNA using energy derived from ATP hydrolysis and 2) it recruits DNA repair enzymes via binding to the UvrA subunit of the Uvr(A)BC NER machinery . The Uvr(A)BC machinery is one of the main players in bacterial DNA repair, and distinguishes itself from other DNA repair proteins by its ability to repair a remarkably diverse repertoire of lesions by utilizing a “cut and patch” mechanism, whereby an oligonucleotide containing the damage is excised and the gap later filled. The cellular role of TRCFs extends beyond TCR. Because of their ability to forward translocate and dissociate stalled RNAPs (or “backtracked” RNAPs that have slid backwards on the template) , TRCFs are also involved in transcription elongation regulation [3, 4], resolution of head-on collisions of the transcription apparatus with the DNA replication machinery , and antibiotic resistance [6, 7]. In humans, the effects of impaired TCR are systemic and complex. Mutations in the transcription-repair coupling factor CSB lead to Cockayne Syndrome , a progeroid (accelerated-aging) disease characterized by severe developmental abnormalities and neurodegeneration, and whose etiology is currently poorly understood. To elucidate the mechanism underpinning UvrA recruitment by TRCF, Deaconescu crystallized and solved the X-ray structure of a core UvrA-TRCF complex (Figure, left) demonstrating that UvrA binding involves unmasking of a conserved intramolecular surface within TRCF via a gating motion of the C-terminal domain (red in Figure above). Despite significant effort so far, Deaconescu is still trying to coax nucleotide-bound TRCF to form crystals suitable for X-ray diffraction. These would be highly informative because ATP is required for DNA binding, and its hydrolysis leads to TRCF translocation on dsDNA and ultimately release of RNAP off the damaged template. Because diffracting crystals eluded her, and to further find out how ADP/ATP modulate the structure of TRCF, Deaconescu learned small-angle X-ray scattering techniques suitable for probing TRCF in solution in the absence and presence of nucleotides, thus circumventing the need for highly-ordered crystals. Then, the Brandeis team and their collaborators at Ohio State employed domain-locking disulfide engineering in conjunction with functional assays to gain a deeper understanding of what TRCF looks like during its catalytic cycle and upon binding to UvrA. 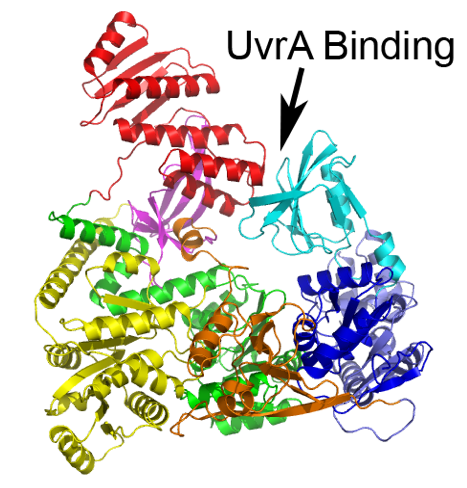 They find that the two main functions of TRCF (RNAP release and UvrA binding) can be uncoupled, suggesting that UvrA recruitment may only occur during/post RNAP release, and not upon RNAP binding as had been proposed earlier in the literature . Furthermore, they show that the ternary elongation complex (consisting of RNAP, template and nascent RNA), but not naked DNA, significantly stimulates ATP hydrolysis by TRCF. 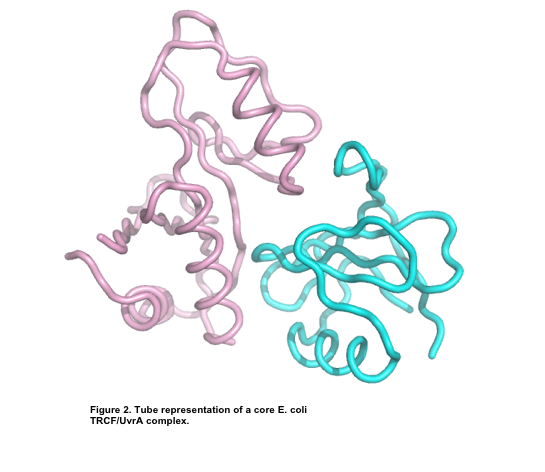 Thus, bacterial TRCF operates in a manner reminiscent of that utilized by eukaryotic chromatin remodeling factors, and are preferentially stimulated by nucleosomes over naked DNA substrates. Deaconescu previously “looked” at TCR using X-rays – as a graduate student she solved the first structure of an intact transcription-repair coupling factor from any organism using X-ray crystallography . She now hopes to reconstitute the larger intermediates that form during TCR and bridge low- with high-resolution information using hybrid structural methods, particularly electron cryo-microscopy, and ultimately formulate a cogent model of how TRCFs operate in cells. Professor of Biochemistry Nikolaus Grigorieff discusses recent progress in obtaining virus structures at 4 Å or better resolution from electron microscopy in a new review “Near-atomic resolution reconstructions of icosahedral viruses from electron cryo-microscopy” in Current Opinon in Structural Biology. Single particle electron microscopy reconstruction can be a powerful tool for determining the structure of large protein complexes. One limitation of the technique is the difficulty in coming up with specific labels for the protein that can be visualized with EM. In a new paper in RNA, postdoc Beth Stroupe and coworkers show that the use of the actin-nucleating protein Spire as a cloneable tag allows them to nucleate actin filaments that then “point” to the location of the tag in the complex seen in EM, and applied the technique to their studies of the C complex spliceosome.